Yesterday morning I took some pictures on my walk up to school. 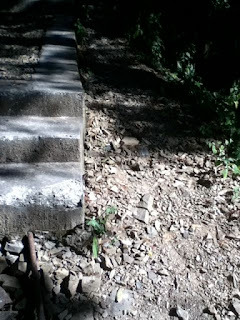 I wish they would show the steepness of the hillside better, but you'll just have to imagine that. This picture is taken from just above Doshisha. It shows the "New" Road (Mussoorie Bypass) with a bus going around the curve. This shot shows how at several places there is a wide spot in the path where people walk to avoid the steps. Just to the right is a sheer drop-off, so being sure-footed helps. 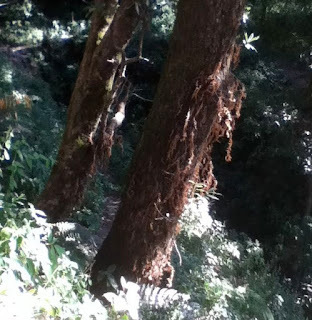 These trees show the dead ferns hanging from their trunks. During the monsoon the trees are almost completely covered with a variety of bright green ferns. It is lush and beautiful. When they begin to turn slightly brown, we know the monsoon is coming to an end. Soon these will probably fall off in a high wind. 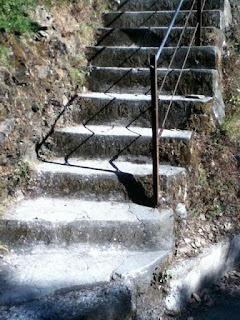 These steps are the most dreaded part of the walk for me. They are just above the New Road, below Doshisha. 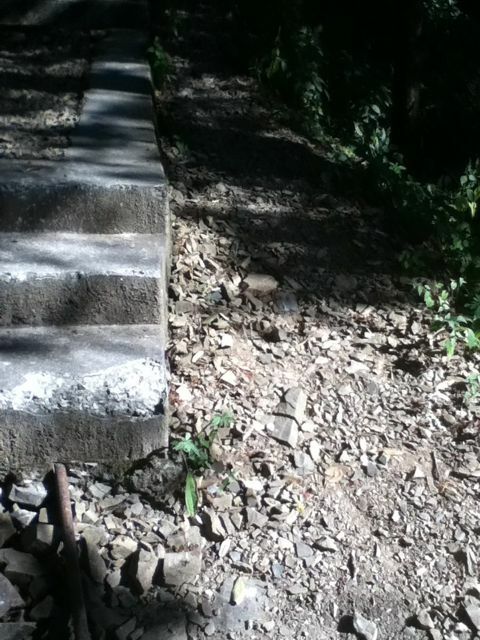 The bottom step is probably about 15 inches, and the next three or four are about 12 inches. 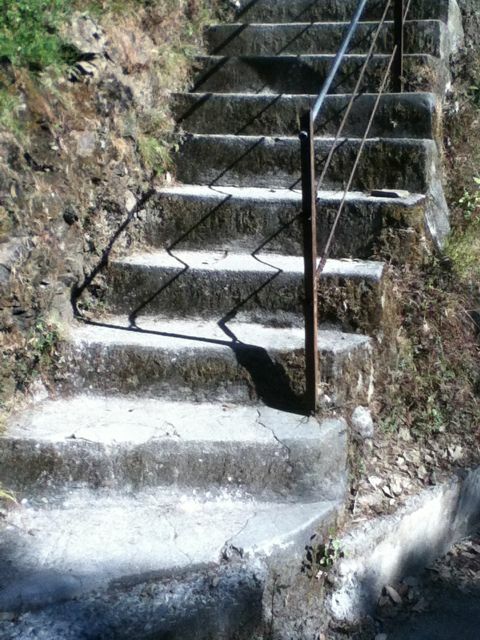 My walking stick helps me get up these! This is the last bit before hitting Tehri Road. 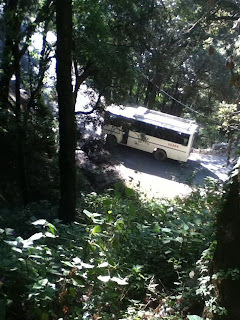 It is more narrow than any of the other sections, and the opening onto the road is quite small. 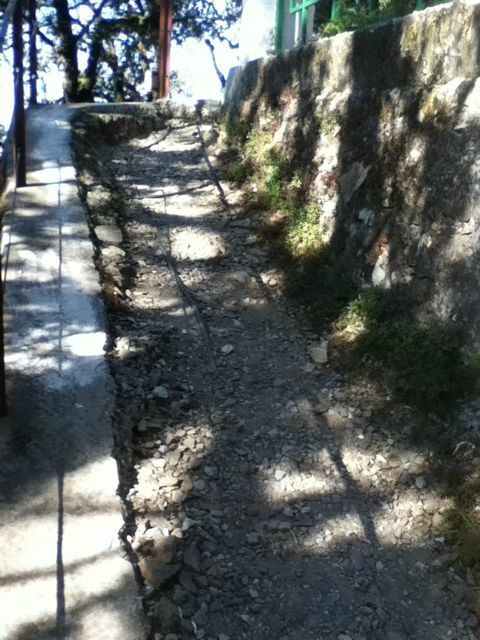 Walking on the road, you could easily miss seeing that this is a major path down. 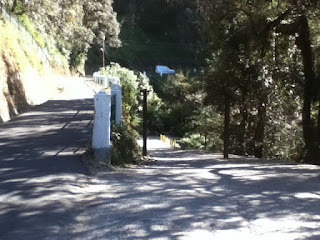 Once on Tehri Road, looking east, we see the road itself on the left, and (dimly) the ramp heading up to the school's back entrance. The road on the right connects down to the New Road, going just under Fern Oaks, where Saroj Kapadia lives. It isn't in very good shape, but it's used quite a bit. It is the only connection between the two roads from the bazaar to Second Jabarkhet. It is the most direct driving route between the school and the residences below. The two posts at the top of the road used to have a bar across, which made it impossible for trucks to enter. I think the bar was removed when some road repair work was being done so that materials could be taken down. The bar on the posts at the bottom of the road is still there. One time last week we were going down on the scooter and a truck was trying to go through. I'm not sure what happened; it backed up slightly and we went on around.